Not Armageddon, just the end of 2006 -- bring on the new beginnings! 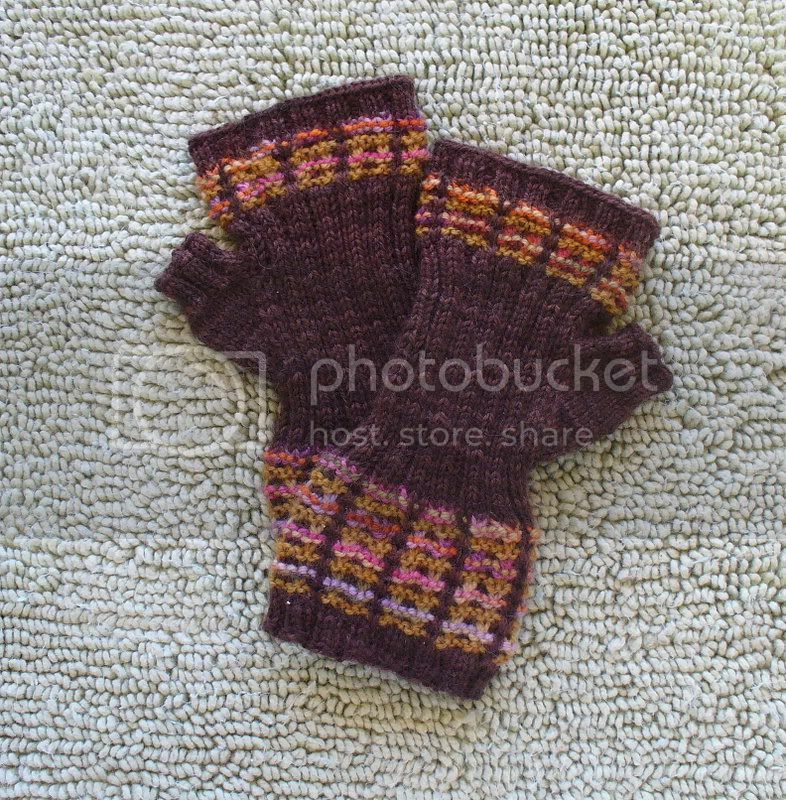 A lot of commenters asked for the pattern and it's readily available at the Six_Sock_Knitalong yahoo group. 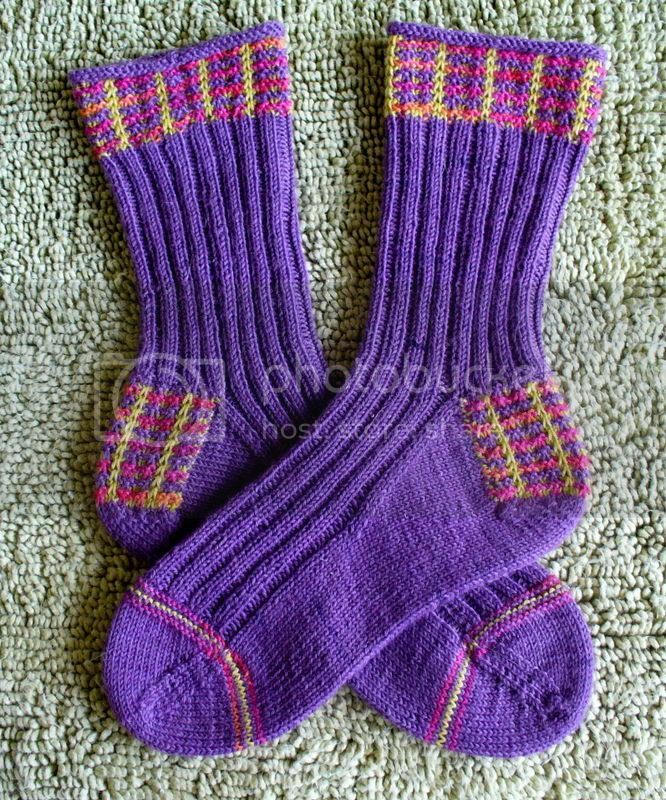 It's called "Michelle's SSS pattern" listed under August 2006 in the file section BUT you must be a member to get the pattern. Cast on an even # of stitches divisible by 4 (52, 56, 60, 64, ect.) I used 64 for my picot edge, then decreased to 60 for the leg and 56 for the foot. I feel the scales do run a bit big because I usually use 64 as my "standard" for a woman's medium. 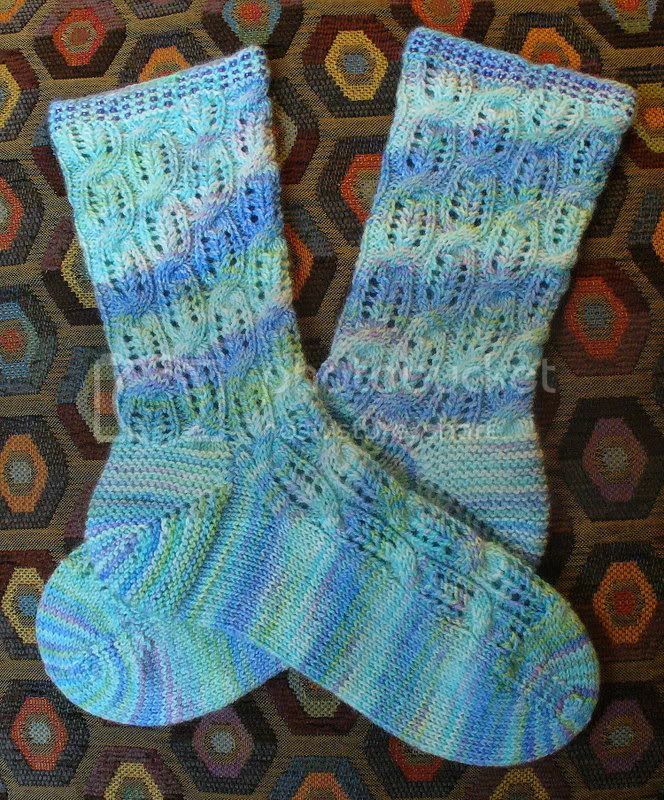 So you can plug this stitch pattern into your standard sock formula and you can have a love affair with your socks too! 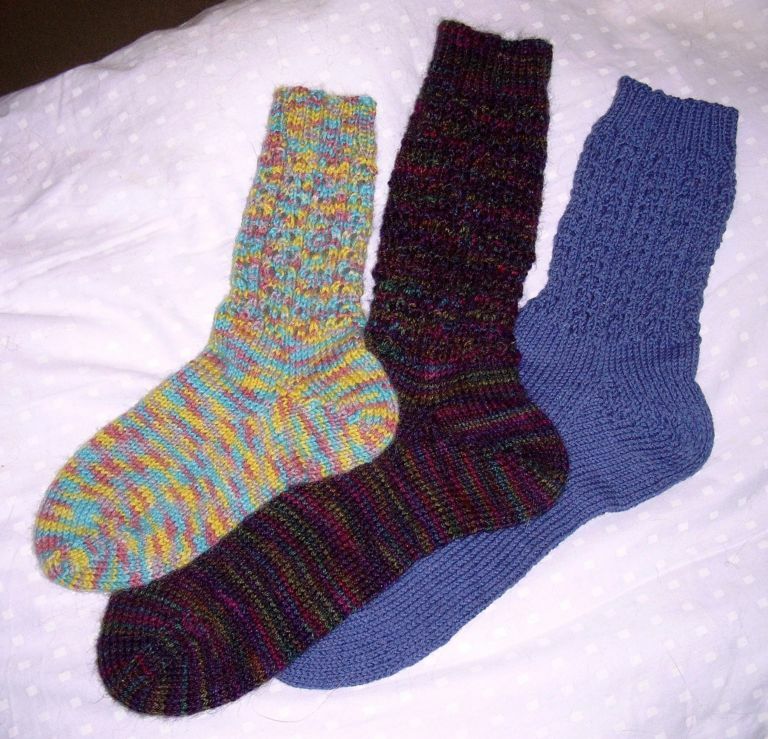 :) And for those more adventuresome among you, why not give beaded knitting a go in 2007? It's so much fun and really enhances the finished object AND there just happens to be a nifty tutorial on my very own side bar! Now for some more knit love, I give you Ruben! 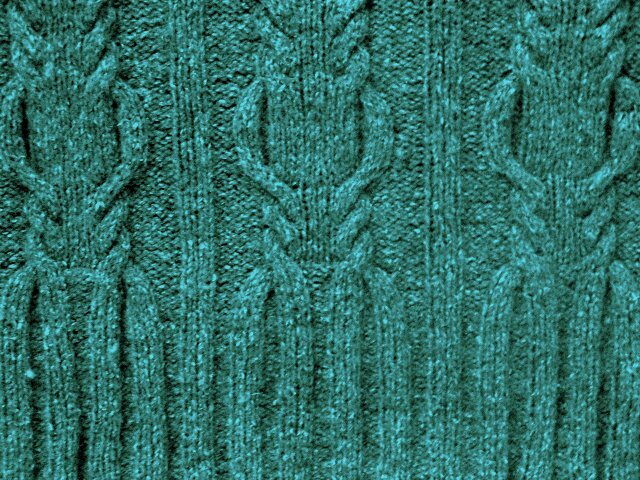 I love this design and I LOVE Silky Wool!! It's become one of my favorite yarns as it knits like a dream and just flows over the needles plus it's sooo soft. 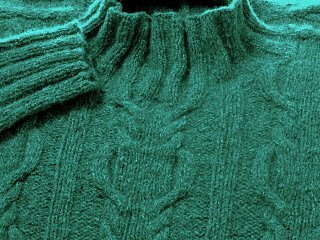 The Silky Wool is pretty fragile, you can pull it apart quite easily and I was concerned about using it for the sweater finishing. Being unable to find a suitable colored yarn to seam with I did use the Silky Wool but *very* carefully and did tear the working yarn in mid-seam a few times. In the end, it's a gorgeous, classic, manly sweater that I would knit again keeping in mind the caveats I mentioned! 5- I'm on the fence about the one "free" day...I would really like to try to make it thru 2007 with no yarn purchases at all! It's not so much that I have this ginormous stash, but that I have yarn for so many projects already that I really want to knit, it just seems a shame for them to be languishng in the stash! That's it! So good luck to me and all the other knitters taking the plunge! Ruben is FANTASTIC! I have yet to knit with Silky Wool, but everybody keeps singing its praises. I, too, am going to be knitting from my stash in 2007, with the more stringent rules, just like yours, and I just happen to have a sweater's worth of Silky Wool in the stash. It's gold, and I wish it were a different color. What a coincidence! I learned to dye this year and I have a decent stash of dye on hand. So I guess I know what I need to do, eh? Happy, Happy New Year, Debi and P-Man! That sweater is gorgeous -- I love how the ribs flow into the cables. That is just a beautiful sweater! I'm with Dave, it's gorgeous! A Very Happy New Year to you Debi! 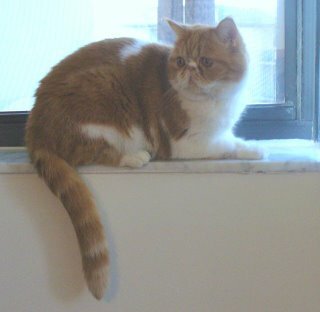 And of course to Pumpkin too! Does the P-Man get some special goodies to celebrate? Some yummy pizza perhaps? Reuben is GORGEOUS! those cables flow beautifully. Glad to hear the positive review of Silky Wool--a frustrating yarn is BAD TIMES for a large project. Did I say those cables are lovely? I adore the way they flow into the neck ribbing. Ruben is a gorgeous sweater. I am sure the lucky fella will love it immediately and forever. Thank you and the P-man for a whole year of fun, pictures, and the always kind knitting help. Be healthy, be happy, and always be knitting! Happy New Year! Have a wonderful new year, Deb. Thanks for the hints on the sock pattern! 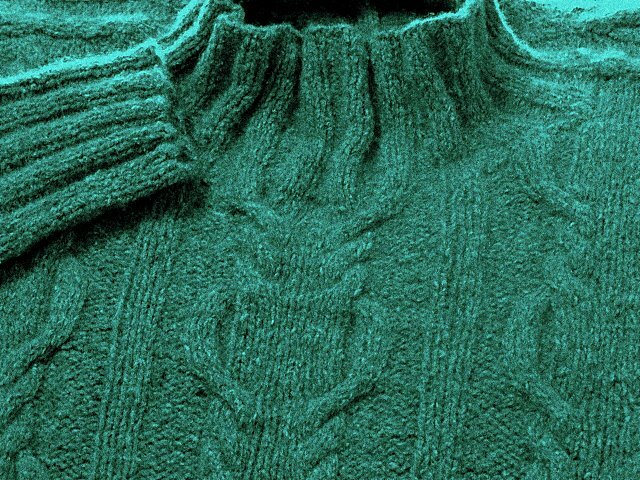 And I love the sweater; very lovely! Have a very Happy New Year, Debi! ONE WHOLE YEAR? Man, that's really tough! But then the other day when a sock kit arrived, my husband said he didn't understand why I had to buy more when there were still so many in the closet! I just don't know how to explain! Tough ... tough ... tough! I've done some swatches and am all ready for Tuesday! Happy Healthy 2007 to you and Pumpkin too. Wow - Ruben is wonderful!! 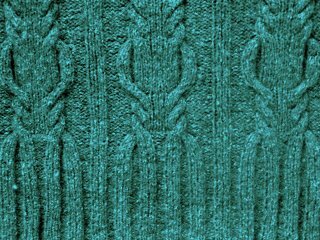 I love the cables and I love Silky Wool. I've only knit a shawl from it, but it's wonderful to wear and has held up well. Happy New Year to you and the P-man. 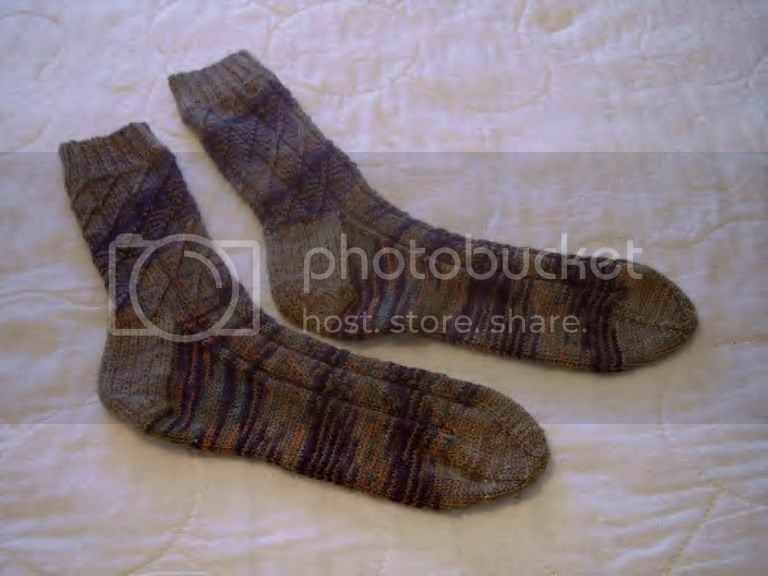 Sock yarn counts? NO! NO! NO! Happy New Year! And I do hope, even if 2006 was good, that 2007 will be FANTABULOUS! Well, here it is 1 hour and 42 minutes into the new year. Yipee, yipee, bletch! Mr. Pumpkin is lookin'mighty fine as is the Rueben sweater. That is a gorgeous color and you did a GREAT job. I wish I could talk myself into doing cables. I really dislike them and the slow-down they give you. Yuck. But they are beautimous. Have a happy year. That is really a gorgeous sweater!! Great job. Too bad you can't feel a blog picture-that wool silk sounds wonderful!! Have a fabulous new year and I'm sure glad to have 'met' you. What was life like before blogging?? Was there life before blogging? 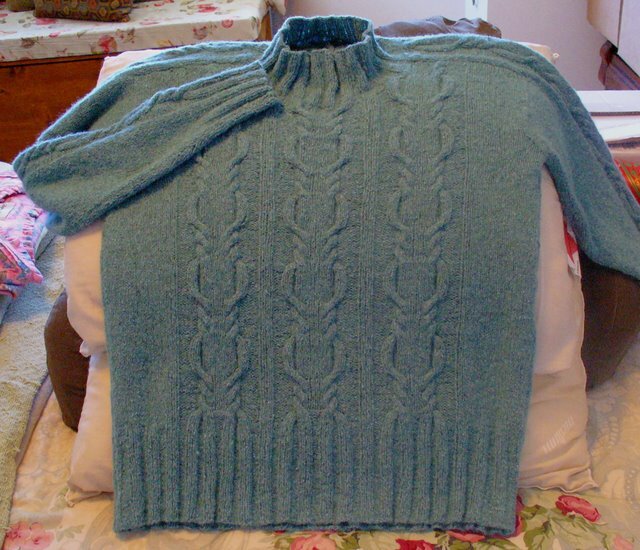 I'm intrigued by the Knit from Your Stash challenge for 2007, mostly because I can't believe anyone has that kind of yarn stored up at home. All I have are oddballs left over from other projects. Since I realize I'm in the minority (at least in terms of bloggers), I just smile when someone else joins. Good for you. That sweater is just beautiful. You deserve loud applause for it. happy new year to you too! I also like those socks, very pretty but I thought that they would be small because my standard ladies is on 72 stitches. Happy New Year to you and the P-man from me and my 3 meezers, Minky, Victoria, and Casper. Kudos for a fabulous job on your sweater. I am So-o-o impressed! It's a good thing I'm not the recipient - I would stand all day gazing in the mirror at the cables! Ruben is gorgeous! Happy 2007! The new sweater is wonderful. Happy New Year to you and Pumpkin. Wow, the sweater is amazing!! What a great looking sweater! Lovely color, looks very comfy, well done! Gorgeous sweater! Bet it feels wonderful, too. What a great sweater!!! You have given me the bug to make it as well. I know what you mean about stash. I could knit for the rest of my life on my stash. At our knitter's guild we have a stash sale once a year. It is basically a stash swap, since most people go home with more yarn than they came to sell. Not quite sure how that works, but it does!! Ruben is gawgeous! I'm still looking for just the right project for my Silky Wool. I'm 100% supportive of you Knit from Stash effort. I'm also with you on the bare-bones rules. I know you can do it, of that there is no doubt! RUBEN is fabulous! I love, love, love it! Happy New Year! I love your Ruben--enjoy it, it's beautiful! happy 2007! give the p-man a little love from me and isabella too. oh, and ruben looks SO GOOD! what an incredible gift. silky wool is really nice. i don't understand why it doesn't get more attention. What a beautiful sweater!! I love the cable pattern and color. Oh, I love your Ruben! 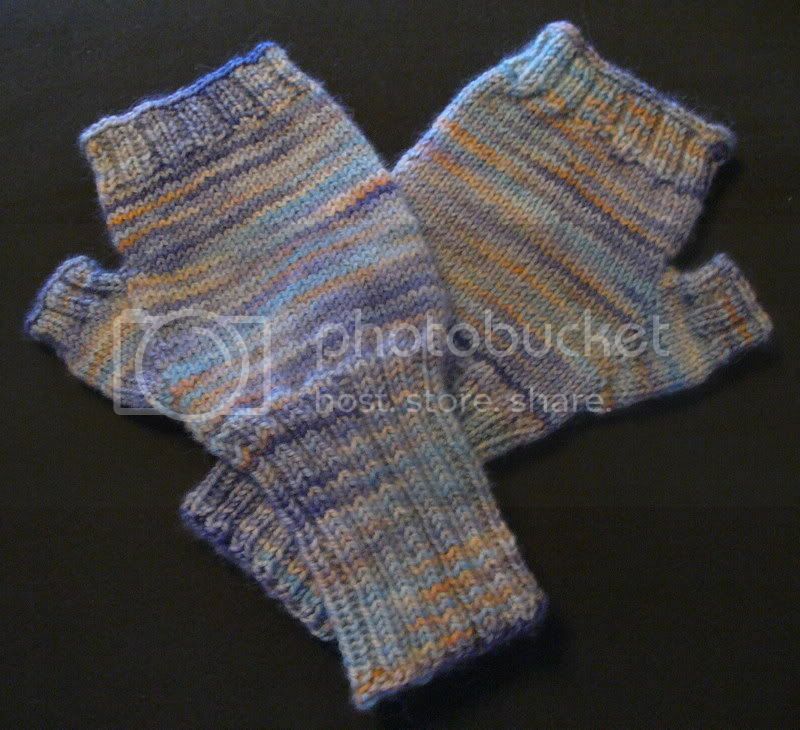 I've joined the Knit from your Stash too -- I really need to! Wow, your Ruben is just gorgeous! The color is so nice too. 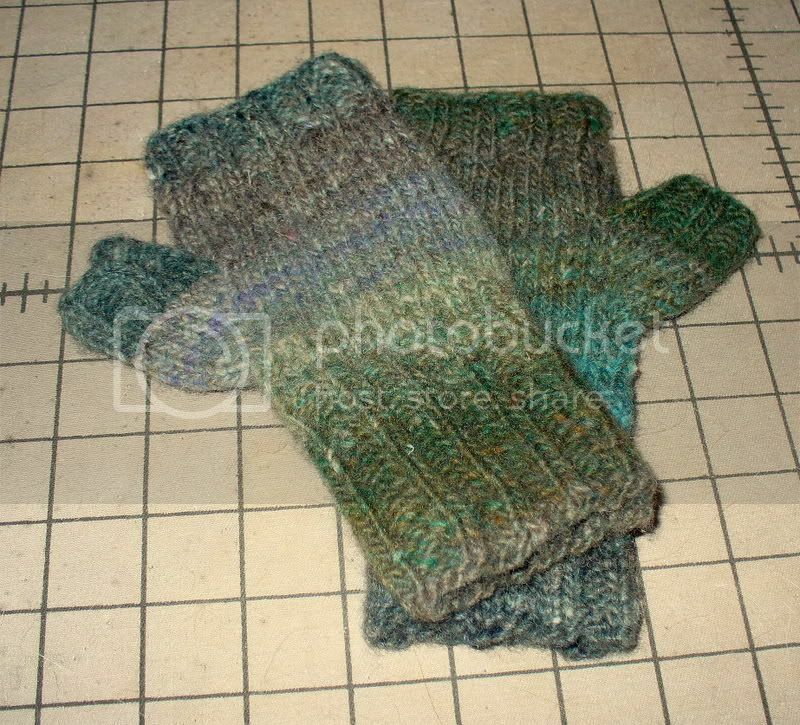 I'm knitting from the Stash too for '07! I'm usually not a big fan of cables but Ruben is beautiful. What a fantastic job you did. Oh I absolutely aodre that sweater. I just love Lavold's patterns though. Let's hope 2007 brings lots of completed projects, lovely yarn, and snuggling with our pets. 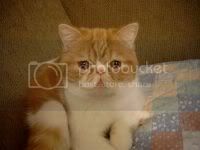 Please give P-Man and hug and a purr from Tigger and I. Here's to a wonderful New Year for all of us. Why are you torturing yourself like this? Does this mean you can't even go window shopping at your LYS? You poor dear.